ROV Deep Drone deploys from fleet tug USNS NARRAGANSETT (T-ATF 167) during 1984 search operations for Korean Airlines Flight 007. Remotely operated vehicle Deep Drone was a Navy-built ROV used for deep ocean salvage and emergency rescue missions in the 1970s and 1980s. It was the first in a series of three Deep Drone vehicles. 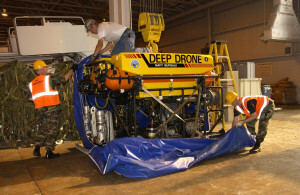 Today the Navy operates the third-generation Deep Drone 8000. Development of Deep Drone began in 1974 when the CNO tasked NAVSEA with procuring and maintaining an unmanned tethered vehicle for use as a rapid response, emergency rescue system and as support for deep ocean salvage projects. Electromechanical specialist Ametek, Inc., earned the building contract from the Supervisor of Salvage in June 1974. Ametek engineers used existing technology and off-the-shelf components as much as possible in designing Deep Drone to simplify maintenance and repair. After taking delivery of Deep Drone in October 1975, the Navy spent six months testing and modifying the vehicle. It entered service in spring 1976 equipped with a CTFM (continuous-transmission frequency-modulated) search sonar, television and still photo cameras, and a 2,000-foot operational depth capability. Over half of the projects Deep Drone participated in between 1976 and 1978 challenged its abilities and required ingenuity on the part of Deep Drone’s operators to complete. The vehicle thus underwent a major system overhaul in early 1979 to double its operating depth to 4,000 feet and add a much-needed seven-function manipulator, lateral thruster, and cable handling system. These modifications significantly improved Deep Drone’s work capability. In June1980, as Deep Drone was readied for sea trials in August, a Navy helicopter crashed off St. Croix, U.S. Virgin Islands, at 3,000 feet. 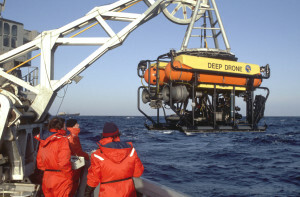 At the time, Deep Drone was the only available Navy ROV capable of operating to that depth. Transported to Puerto Rico by an Air Force helicopter and brought to the site aboard Navy tug USNS Powhatan (T-ATF 166), Deep Drone embarked on the investigative and recovery mission. Thirty dives were conducted over 38 days to recover debris scattered over a 1,000-foot diameter area. Deep Drone performed excellently, lifting objects weighing 300 pounds or less and attaching lift lines for heavier pieces, and the majority of the helicopter was recovered. Deep Drone performed many routine salvage missions due to its success rate, reliability, and ease of deployment. In December 1981, while on a recovery operation off Norfolk, Virginia, the ROV’s umbilical tangled in its support ship’s cycloidal thruster, causing Deep Drone to sink. Fortunately it carried a marker beacon which was detected easily by a beacon locator system. CURV III, operated by the Naval Ocean Systems Center in San Diego, was used to recover Deep Drone in January 1982. Repairing the damage sustained in the incident required almost a full rebuilt, during which Deep Drone’s depth capability was upgraded to 6,000 feet. NAVSEA transferred Deep Drone to the U.S. Naval Undersea Museum in 1987. It has since developed improved versions: first Deep Drone 7200, with an operating depth capability of 7,200 feet, and then the Navy’s current Deep Drone vehicle, the Deep Drone 8000.